"I went to a place called Moon rakers in Mahabs on my way back from Pondy, the place and food was horrible". "Oh really? What did you order there?" "I ordered a pasta and one lasagna and my friend ordered a chicken fry and food was very average". This was a conversation I had with my colleague and you can imagine who said what. I have no idea why moon rakers has those things on the menu, but if you do not know what to eat here, then you will be disappointed and you will be missing something in life. 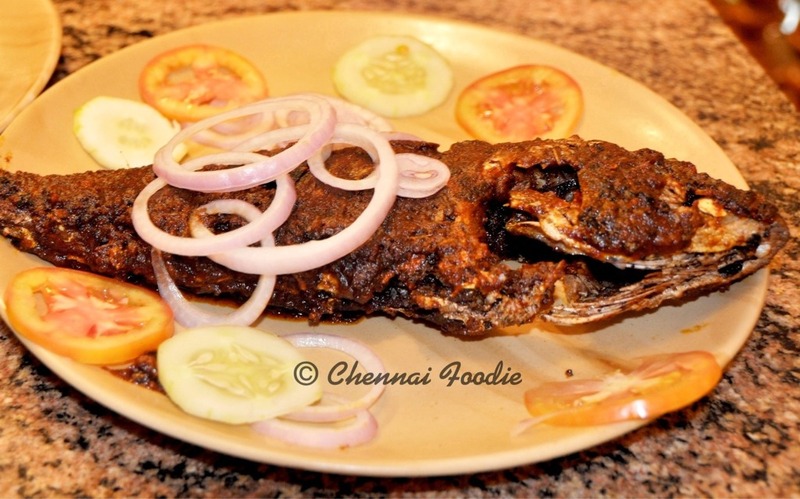 This is a place you ask for your seafood to be grilled with the house masala and served with either rice or parota. Your seafood of choice can be a lobster, a tiger or jumbo prawn, a full red snapper fish or a crab. If that variety is not enough, you may add a fried calamari to your order and maybe a chicken dish to add more variety, but if you try ordering Italian, then God save you. Fancy restaurants have the"catch of the day", but here it is "what all I caught today". My wife and me were there a day before my colleague went there and we both were super satisfied. We got ourselves a small red snapper and one portion of two jumbo prawns grilled with the house masala and both were brilliant. This place is among the few places I enjoy eating fish and I wish it was closer home. The prawns were super sized and I enjoy the experience of eating jumbo prawn that is not shelved, so you have to break the shell and bring out every bit of meat. I am not a big fan of crab, but the crabs and lobster here can sometimes be equally good. The fried calamari (squids) are a general time pass if we are a group, but that day, we had just the two with a portion of fried rice and two parotas. You can actually bargain on the catches of the day. The waiter will usually settle for 75% of the price he quotes initially, but if he says that he cannot give it you cheaper and walks away, then settle for that price, cos it is worth it. Some groups come in and choose the biggest fish he brings, but avoid that as the flavor will not seep in well enough and you will have some ungarnished fish to deal with, so go with the fish priced to a max of Rs. 400. 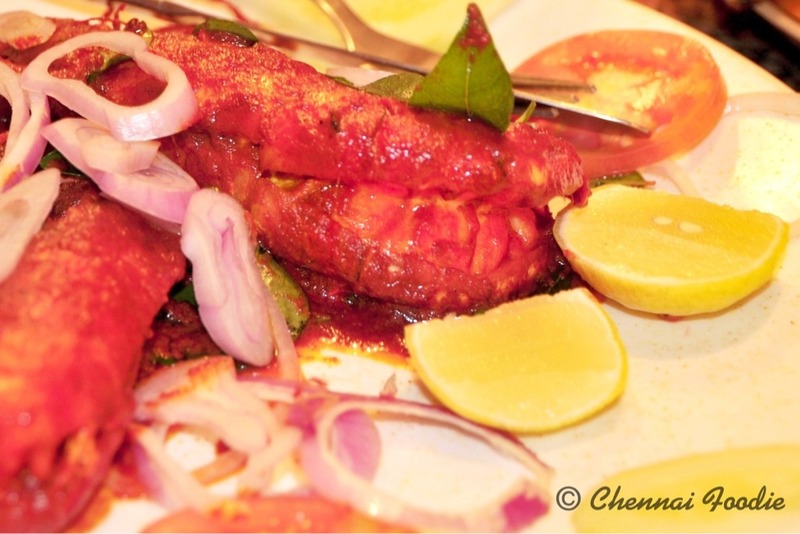 Just ask for the house masala and wait for your seafood to arrive and then it is bliss. Same with the lobster, instead of picking the biggest lobster, ask for a lobster weighing between 500 and 900 grams, they are the tastiest. Service is shabby and "local", but there is no service tax, while the ambiance is non existent. Moon rakers is in Mahabs, when you go from Chennai, the first big left after you enter Mahabs called Otha Vada Street, is the one which has moon rakers and their parking space is diagonally opposite the restaurant.